eTrack’s flagship feature that sets us apart is our world class scheduling and resource management. It is used by large government Audit Offices to schedule 300 staff across 1000 projects so you have the confidence it is fast and robust. Whether or not you need it now, it is important to invest in a future proof system and there is no charge if you don’t need it. Schedules, Timesheet entries, Baselines, Resource allocations and utilizations all on one screen. Resource allocations are dynamically updated as schedules are edited. 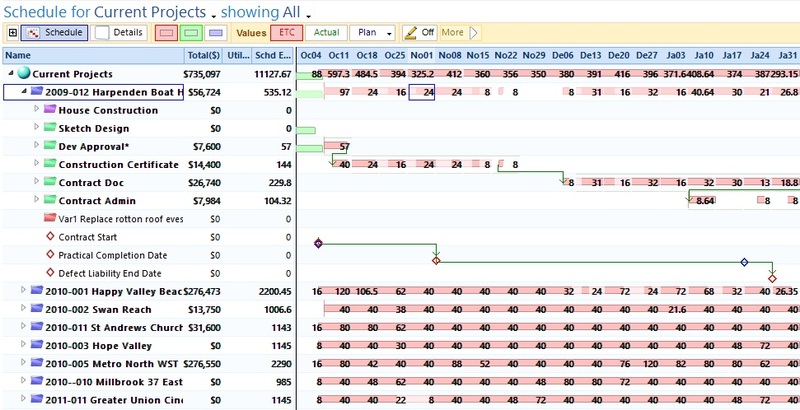 Combines power of a spreadsheet with ease of use of a Gantt Chart. Automatically updated as timesheets are entered. Includes milestones, dependencies and you can schedule each resource separately. The picture above shows the schedule of a typical architect project. The tree on the left shows milestones, phases and assigned resource. The terminology and structure of your eTrack will be configured to match your business and there is no limit to the number of levels (eg: Project, Phase, Task, Activity…). Various columns can be displayed, the picture showing Charge$, Utilisation% and Estimate to Complete Hours. The above picture shows the same schedule in Hours/’Day resolution with Actual Timesheet hours graphically displayed. 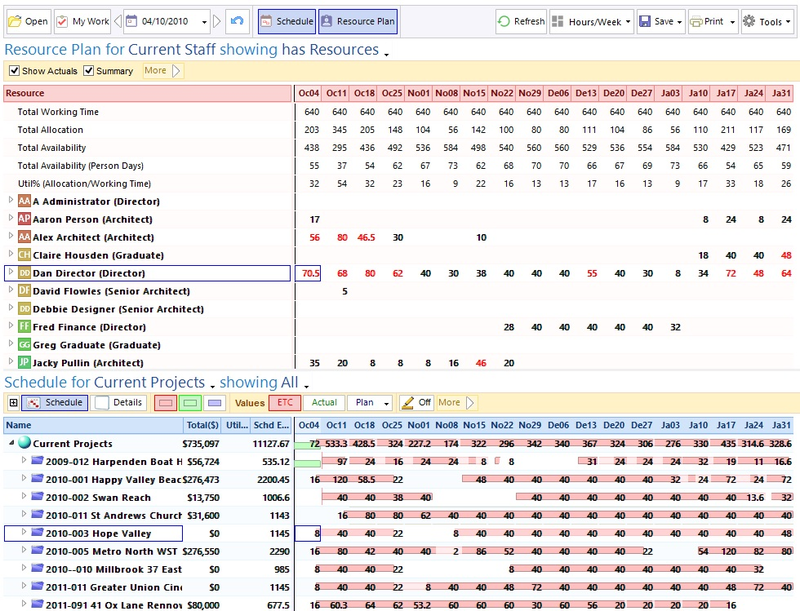 While scheduling your project, you can watch how this effects the allocation of your resources. 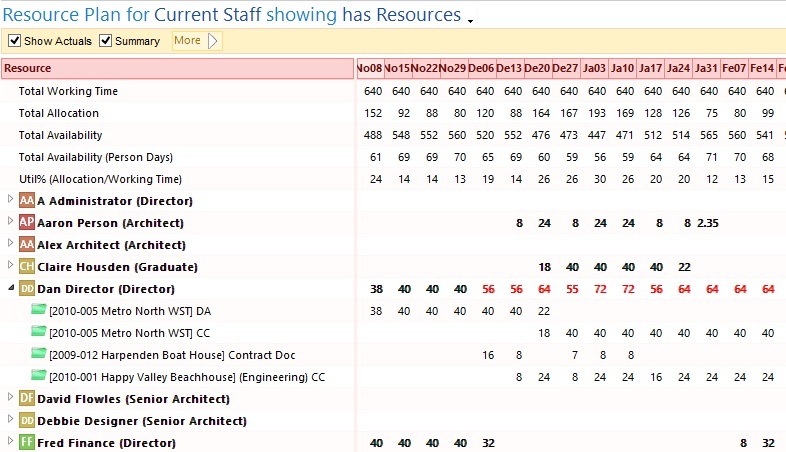 Assigned staff, roles and equipment will go red if over allocated and you can expand each Resource to see their work. A summary view as shown at the top of the above picture will show allocation, availability and utilization across the group of resources you have chosen to view, both for the past and the future. It is dynamically updated as you edit the schedule below. Each staff member has a calendar allowing non working time such as holidays or training to be scheduled. There is also a Company Calendar for public holidays and company shutdowns that each staff members’ calendar inherrits. A program or portfolio of projects may be viewed in the schedule at the same time. Each project can be expanded and edited separately. Dependencies with leads and lags can be created between projects or even between tasks within two projects.